The tendency of environment care extended on all spheres of life is increasing. In the car manufacturing industry changes are occur constantly. More hybrid engines, new types of biofuel and alternative energy are developed. Developing of more fuel efficiency engines creates more strict environmental standards for fuel and it became a commonplace. Compliance to these standards is not always can be reached only by engineering development, as some indicators can be improved only by using additive advance. For improvement of engines operation and diesel advance, especially in winter time and increases in overall performance of the engine additives should be applied. Components for increasing cetane number in diesel fuel, don’t have any negative impact on fuel characteristics therefore are very useful and often applied in vehicle fleets. Additives in the form of biofuel have also positive impact as they have washing properties. It is recommended to apply cetane additives only in cases when fuel possesses big greasing ability. Unfortunately, components which increase cetane number can lower greasing property of fuel. Usually, additive advance in fuel which has low greasing properties can lead to damaging parts acceleration of the engine. It can cost a good price to the owner of the car therefore it is necessary to check stabilizers, to be convinced that properties of the components are suitable for use with current type of fuel, which won’t change greasing property of fuel. Uses of various improver and biofuel advance in a mix with usual gasoline are good for it improve. Modern fuel systems assume use of high-quality gasoline, they are very sensitive to fuel and it is not allowed to form any deposits in them. Washing additives are good for petroleum advance and effectively solve this problem therefore completeness of combustion of fuel increases and toxicity of emissions in the atmosphere decreases. The similar effect can achieve at plant, but there are few plants are able to afford expensive technologies for fuel properties improvement. Improvers can be added directly on oil depots or on gas stations by using fuel blending system. In many cases it is important to add additives – for fuel production which response to the standard, improvement of some parameters is necessary. The content of aromatic hydrocarbons, benzene, sulfur, etc. is regulated in fuel. When rationing the content of aromatic hydrocarbons there is a loss of octane units which can be compensated by application of an anti-detonation additive. 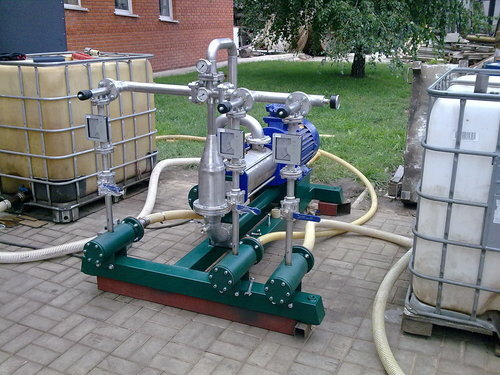 Additives have to be made by following all technology, and be entered into fuel only using the modern equipment such as additive blending system, for avoiding fuel stratification with components. High level of production safety also provides big environmental friendliness, production blending according to new requirements for environment protection constantly changes. Now it is possible to tell that the economy and ecology in production of oil advance products go together. Only eco-friendly fuel will conform to the standards, and the higher quality, then simpler for producers and distributors keep standards and to realize a product in the competitive environment. 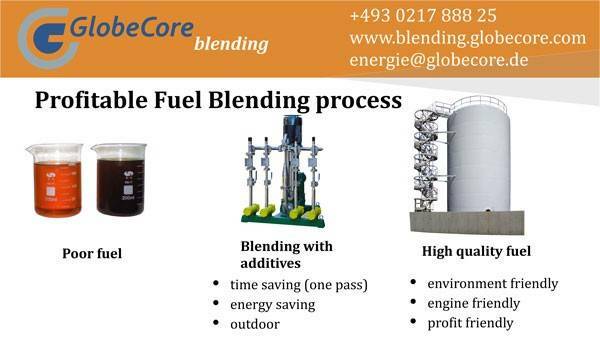 GlobeCore Blending company put a mass production, a number of fuel and any liquid mixing installations. These systems are manufactured as stationary and mobile execution (the mobile can be mounted on trailers and semi-trailers, vans and railway platforms and as any other mobile means). Production of all units is coordinated with the customer and generally made under individual requirements depending on demanded final product.